American River: Confluence follows three families as they find a way to come together to celebrate life, art, and diversity. 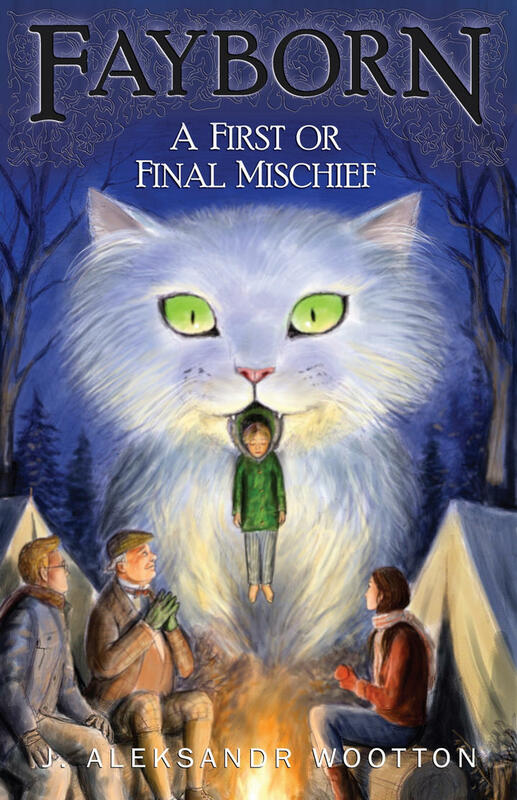 What direction did you take in this book that was different from the first two books? I’ve always thought of a trilogy as being similar to the Sonata form in music—a musical structure consisting of three sections: the exposition (in which the main ideas are introduced), the development (in which those ideas are examined and explored) and the recapitulation (or resolution in which the main themes culminate in a conclusion). In this musical form, there might also be an introduction (or prologue) and a coda (or epilogue). Because music is one of the main components of my writing, I had in mind the Sonata form as I developed the American River story. 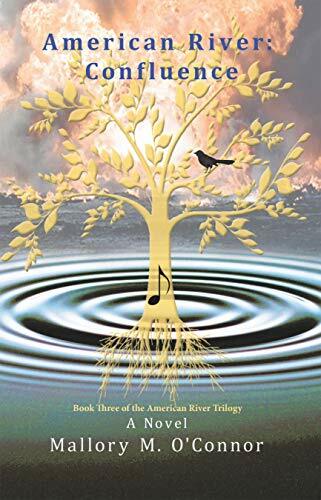 Book One, American River: Tributaries, introduces the story of the three immigrant families and involves the reader in their struggles to overcome prejudice and to follow their dreams and ambitions. But it ends with a tragedy that further separates the characters from each other. Book Two, American River: Currents, further explores the issue of discrimination and the struggle to overcome both external prejudice and internal delusions. Swept away by their passions, the characters find themselves flailing and unable to navigate the deep waters that threaten to destroy their dreams. I knew that Book Three, American River: Confuence, would be about a resolution of some of the issues that my characters face, but they would also discover that in order to realize their unique destinies they would have to find a way to work together toward a common goal. You are able to bring to light many perspectives on social issues without inserting your own opinion on the reader. What was the balance for you in discussing these topics? A recent review posted by Literary Titan states: “O’Connor’s work involves a host of social issues—sexuality, politics, race relations—all disguised in what [first] seems to be a book about artists pursuing their passions.” Each of my characters has a particular role to play that reveals the social issues that affect them. They don’t all have the same views which allows them to interact with each other and voice their opinions. I wanted to help the reader understand that there are always at least two sides to an argument, so my characters represent different points of view as they attempt to navigate the rocky shoals of confrontation with each other. A discerning reader will likely be able to figure out where my sympathies lie, but I wanted an opposition to play off of. The characters end up debating the issues and the readers can decide who gives the most persuasive argument. There are many characters and plots that run through the trilogy of books. Were you able to accomplish everything you set out to? I doubt that most writers are able to accomplish everything that they’d like to include in a story. I had to make some pretty painful cuts during the many revisions, but I wanted to be sure that the story moved along and that the flow was not needlessly interrupted. In the end, I think I was able to address many of the problems that I hoped to cover—racism, sexual identity, mental health, political conflicts, women’s liberation, cultural differences—and to give the reader a lot to think about. Do you plan on continuing the story of these families in another series or are you moving on to a new story in your next book? I actually have an outline for three more books in the American River series subtitled Whitewater, Reflections, and Water Music. I thought it would be exciting to follow the thread of the character’s lives through another decade and see what they encountered. Maybe someday I’ll get to that. For the past thirty years, I’ve researched psychic phenomena and I have a number of contacts in that area of interest. I’m also very disturbed about the rapid rate of climate disruption as warming temperatures upset the balance of nature. And I’m also concerned about what global warming will mean for our cultural treasures—works of art and architecture and their preservation in the face of social and meteorological upheavals. So, with that in mind I’m working on a series of psychic novels that will address the issues of fracking, water resources, the spread of infectious diseases, climate-induced migration and other similar problems. My main character is a psychic medium who in the first book is called upon to work with a very skeptical PI who is an ex-FBI art crimes investigator. Again, the deep line that separates the world view of the two main characters will allow me to explore each of their views on a variety of topics that I believe are important—the nature of time, the impact of climate disruption, and the significance of our cultural heritage. 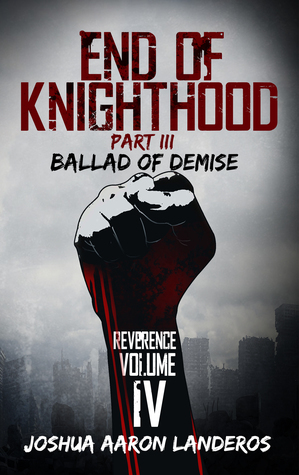 Ballad of Demise is the third and final installment of the End of Knighthood series by Joshua Landeros. Set in the far future, we continue following Will Marconi, the renegade cyborg super soldier, who is aiming to launch an assault the same night as the International Summit. Chancellor Venloran, emboldened by his victory against the resistance fighters, moves into the final phase of his scheme. The International Summit will draw leaders from all over the world to New York City, and he will be able to achieve peace through the dominance of his design. It is up to Will, Alex, Bri, Gabriella, and others to stop the Chancellor and his deadly minions. Ballad of Demise is an explosive and satisfying conclusion to the End of Knighthood trilogy. Landeros has been getting better and better with every installment. Expanding the borders of military science fiction, Ballad of Demise incorporates elements of horror through war and the suspense of a thriller. All of this adds up to a book that does its best to defeat the conventions of the genre and archetypal narrative structure. While confining this book to virtually 48 hours and flashbacks, one would think this is a bold move from a relatively new author, but Landeros manages to pull this off with skill. The pace is snappy and engrossing for the reader. The internal struggle of Will and even Venloran shape the tone and theme of the work, which keeps asking if the ends justify the means. Even for the proposed hero, Will finds himself questioning if everything is acceptable for him to have his vengeance. If there are any issues in this book at all, it would be that Landeros tries hard to stretch out these two days. Some of the action seems forced, and in other places, the dialogue slows the pacing but never enough for the reader to notice for too long. These are minimal problems and ones that take nothing away from the story itself. For a trilogy, this series sets a high mark for the rest of Landeros career. In other ways, readers will be sad to see this cast of characters go but maybe they will return in future stories? Either way, this book is memorable and a fantastic sound off for Will Marconi. One can hope that such a world does not arise in the future, but these books seem to be asking, what if? 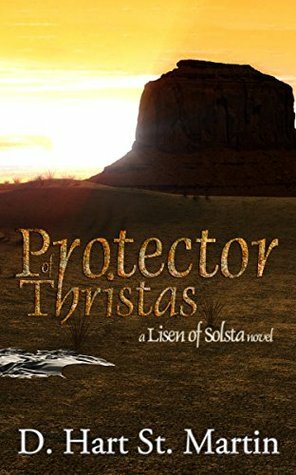 In the final installment of the Lisen of Solsta trilogy, Blooded by D. Hart St. Martin takes us on a gruesome journey as we learn how Lisen as Empir of Garla will affect the future of the Garlan people. After ascending to the throne, Lisen must make major decisions while facing her own physical and mental battles alone, especially when she’s captured by rebel Thristans for a period of time. On the verge of a devastating war, Lisen and the holders of Garla face the bloodthirsty Thristans in a battle that reveals the truth of the hermit’s prophecy and whether peace can ever truly arise between the two nations. In Blooded, the concluding piece of the Lisen of Solsta series, Lisen becomes Empir Ariannas—without Korin at her side, though, she struggles with this new sense of authority. As a result, Nalin becomes a vital figure who assists Lisen with developing the knowledge and skills needed to rule over Garla, and he becomes even more important when Lisen is captured by rebel Thristans. 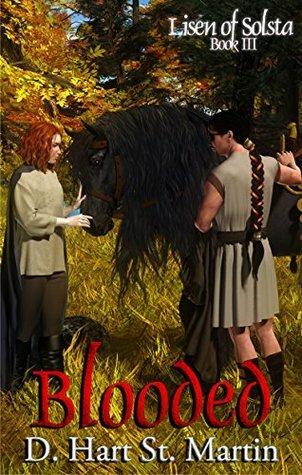 Blooded also follows Korin’s return to his homeland, Thristas, and he experiences his own dilemmas, as he realizes his connection to Lisen is much deeper than he originally thought—in this world, where gender norms are shattered, men or women can carry a child, and Korin is carrying his and Lisen’s baby (unknown to Lisen). Hart St. Martin’s impressive fantasy world construction throughout the entire Lisen of Solsta series kept me so absorbed in the story that I couldn’t put this last book down—I had to know how the series ended because I felt genuinely invested in these carefully-constructed characters. For example, along with everyone else in Garla and Thrista, Lisen resembles a human, but she has a flat chest, a furry belly, and a marsupial-like pouch. In Blooded, we learn more about the “unpouching” or birthing process in this world by witnessing two important “outcomings” or births. St. Martin makes these moments suspenseful and full of emotion by showing two birthing events from different perspectives. While Korin is raising his and Lisen’s child in Thristas, Lisen faces her own mental struggles when she realizes that the Thristans are planning to go to war with Garla. This climactic moment in the plot, where Lisen and her Council devise a plan for war, showcases the dynamic development of both Nalin’s and Lisen’s characters throughout the series. During Lisen’s abduction by the rebels, Nalin becomes a strong-minded, confident leader, commanding Lisen’s Council to make major decisions in Lisen’s absence. On the other hand, Lisen sets aside her typical sarcastic, sassy attitude and at times she reveals her emotional turmoil a bit more, as she feels overwhelmed by death piling up around her and the possibility of war. Bala, a significant character from Tainted, becomes instrumental to the plot of Blooded once she’s granted a spot on Lisen’s private Council—when the Garlans go to war, Bala shows her true colors as an assertive leader for her troops. It’s rare to find a series of books that keeps your interest until the very end, and the end of Blooded and the Lisen of Solsta series left me feeling a great sense of closure. With characters that felt so real within a uniquely constructed fantasy world, this series captures the best aspects of the fantasy genre while also pushing the genre’s boundaries through constructing a gender non-conforming world.